EPP members made discrediting comments about the Colombian Coordination Groups, suggesting that they are close to the Revolutionary Armed Forces of Colombia (FARC-EP), one of the parties in the Havana peace dialogues. Bogotá and Brussels, 5 June 2015. NGO coordination groups and victims’ and human rights organisations have condemned censorship and discrediting levelled against Yessika Hoyos in yesterday’s session of the Committee on Political Affairs, Security and Human Rights of the Euro-Latin American Parliamentary Assembly. Unexpectedly, MEPs Luis de Grandes Pascual and Asgustín Díaz de Mera made discrediting comments about the Colombian Coordination Groups, suggesting that they are close to the Revolutionary Armed Forces of Colombia (FARC-EP), one of the parties in the Havana peace dialogues. Colombian parliamentarian Oscar Darío Pérez Pineda also made similar remarks. These serious remarks are not only untrue; they also aggravate the situation of risk faced by members of the “José Alvear Restrepo” Lawyers’ Collective and by Colombian human rights defenders in general. Besides being a prominent human rights defender, Yessika Hoyos was part of a group of 60 victims invited by the parties to the talks in Havana. It is contradictory that after the Eurolat Commission voted to refuse her participation in the meeting, Parliamentarians noted the importance of civil society participation in the peace process, thereby failing to notice the seriousness of what had just occurred, and not even granting Yessika the right to reply. We urge the Colombian Government, led by President Juan Manuel Santos, to make a public statement about these events, which have added to the stigmatisation already faced by victims, human rights defenders and the discrediting of the Colombian peace process. We also urge the government to ensure that real guarantees are in place for the participation and protection of human rights defenders. We also demand that the EUROLAT Executive Bureau makes a public apology to Yessika Hoyos and the “José Alvear Restrepo” Lawyers Collective and publicly recognises the important work of Colombian Coordination Groups in promoting peace and human rights. Similarly, we request that MEPs Luis de Grandes Pascual and Agustín Díaz de Mera publicly retract these remarks that attack the dignity of victims and organisations defending human rights and expose them to serious risks. 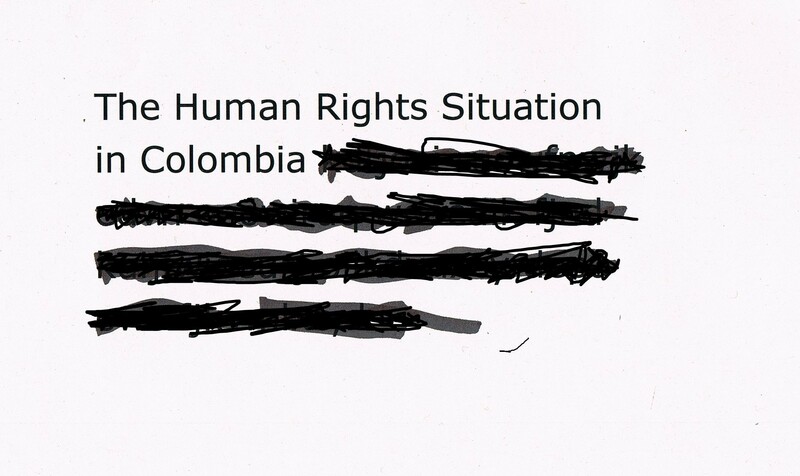 It is incomprehensible that while in Colombia there is space for high-level dialogue with human rights defenders, Colombia’s diplomatic representation abroad headed by its ambassador, is unable to defend the legitimate work of Colombian human rights defenders. Yessika Hoyos, a member of the “José Alvear Restrepo” Lawyers’ Collective, had been officially invited to the session of the Eurolat Committee on Political Affairs, Security and Human Rights, to speak about the peace process in Colombia from the perspective of civil society, on behalf of important Colombian and European Human Rights Coordination Groups (namely the Colombian Platform for Human Rights, Democracy and Development; the Colombia-Europe-United States Coordination and OIDHACO). After these irresponsible remarks were made and in the presence of Colombian Ambassador Rodrigo Rivera the meeting proposed a vote on the exclusion of Mrs Hoyos from the meeting. Sixteen deputies voted in favour, three against and two abstained. In this way the voice of civil society, represented by a victim of human rights violations, was excluded from this parliamentary forum.